The VIP Laser Clinic introduces you the i Lipo Laser slimming - the latest diode laser technology for fat removal. How does i Lipo Laser help you? Each single treatment session with i Lipo Laser helps you lose fats non-surgically, i.e. safely and comfortably, without any pain, without any needles, without any surgery and without any down time and at the same time it helps you effectively shape up your body. How does i Lipo Laser work? 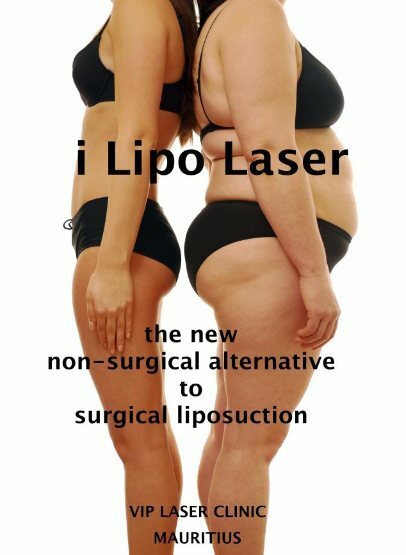 The i-Lipo Laser has got thirty-two powerful diode lasers that emit therapeutic low-level laser energy initiating a light-induced chemical reaction in the fat cells which causes the degradation of the stored triglycerides into free fatty acids and glycerol that eventually get evacuated from the fat cells that lose their round shape. The released fatty acids and glycerol flow out of the disrupted cell membranes of fat cells into the interstitial space and are then transported around the body to the tissues that use them metabolically in order to create energy. These processes of release and utilization of fatty acids don't interfere with the course of natural metabolic mechanisms in the human body and, therefore, don't cause any harmful side-effects due to treatment by i Lipo Laser. Such natural processes involved in fat removal do not alter any structures surrounding or neighbouring the fats, such as skin, peripheral nerves, blood vessels and lymphatic vessels. Why choose i Lipo Laser for getting rid of fats? How to follow the i Lipo Laser treatment and how many sessions are needed in general? A course of 10 treatment sessions is recommended on the average for each body zone over a period of 5 weeks with a frequency of 2 sessions per week. However, the total number of treatment sessions will largely depend on the amount of excess fat deposit in the concerned body zone. In case you have got huge and/or stubborn fat deposits, you might need to do another series of 5 to 10 sessions or more. The number of sessions you would further need after the initial 10 sessions depends on the amount of fats left, if any. In general, people have got very good and satisfying results with any number of sessions required. What should I do apart from i Lipo Laser treatment for enhancing fat loss & shaping my body? The intake of professional slimming products will help you lose your fats more rapidly, especially with their drainage, detoxifying and anti-oxidant effects. Physical exercise is mandatory and is highly recommended after each i Lipo Laser treatment as it helps activate the transportation of the fatty acids liberated from laser-treated fat cells to different areas of the body where these fatty acids are further converted into energy for metabolic use. Dieting will help you further reduce your excessive fat deposits and your body weight as well as shape up your body more rapidly.